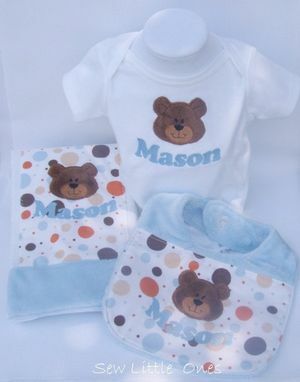 This listing is for a 3 Piece personalize baby gift set. 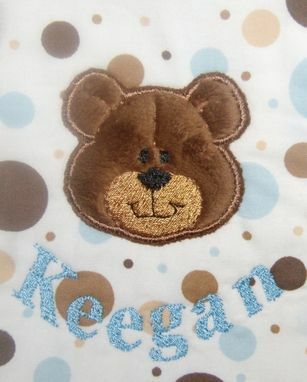 Embroidered with baby's name or saying of your choice and design makes this personalized set an adorable baby gift. 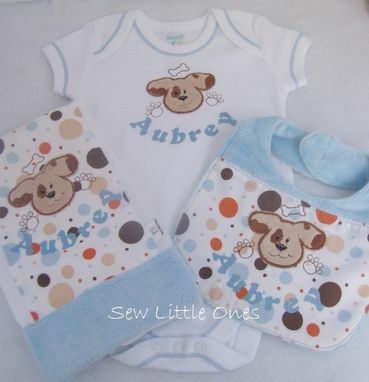 This blue and brown polka dot set can be created with three items which includes: bib, burp cloth and all-in-one with coordinating appliquéd brown teddy bear or spot the dog. 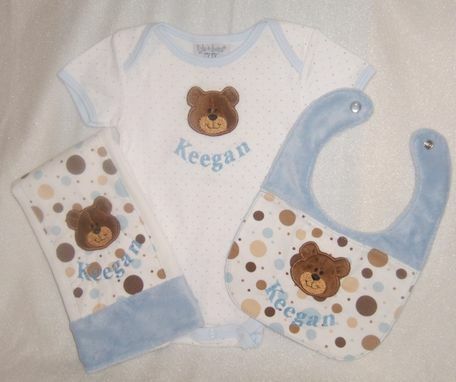 Bib is top stitched and has a snap closure for added durability. Upper portion of bib is blue minky. Burp cloth is made from an absorbent cotton premium quality prefolded diaper with coordinating accent fabric as bib. Bib measures 11" x 8.5"
Burp cloth measures 14"x 19 1/2"
All-in-one: 3-6 Months, if no size indicated. Available for both boys and girls-convo with specific choice of color or animal ( Bear, dog, butterfly, cat, monkey, bee, cow, lady bug, turtle...just to name a few).